The English Vocabulary Profile offers reliable information about which words (and importantly, which meanings of those words) and phrases are known and used by learners at each level of the Common European Framework (CEF). Note that some plugins, e.g. 'adblock' can make the 'Advanced search' section disappear and will need to be disabled for this functionality to work properly. Much more than a list of words! The English Vocabulary Profile contains information about phrases, idioms and collocations as well as the words themselves. By leaving the text box blank and selecting one of the levels, you can generate lists of words for each level; but you can also filter these using the advanced search functions, to find out what 'food and drink' vocabulary A1 learners know, or which phrasal verbs are known at B2 level. 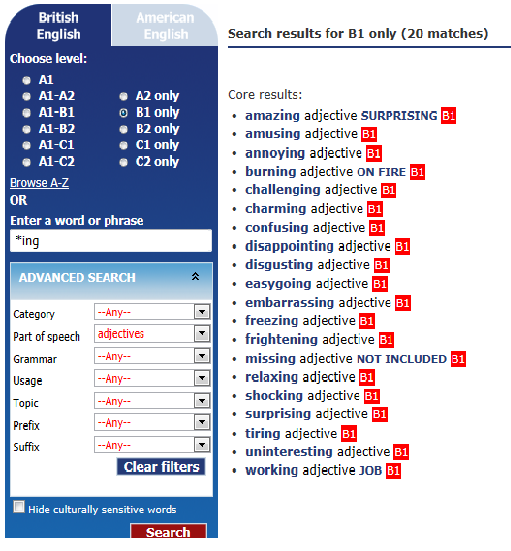 You can also use the wildcard * search to discover, for example, which '-ing' adjectives are known at B1 (see example). There is a British and American English version, and there is audio pronunciation for all entries. The EVP forms an invaluable reference source for anyone involved in syllabus design as well as materials writers, test developers, teachers and teacher trainers.